Do you know what today is?? Today is a very special day. I know I missed a week and I’m super-duper sorry. But, it was either miss a week or post a really terrible picture that wouldn’t have done the taco justice. I just couldn’t. So I waited a week for a better taco, a better picture, and an ah-may-zing roasted salsa. Totally worth the wait, I promise! Mmm…spicy-seasoned steak, grilled to melt-in-your-mouth perfection, with creamy guacamole, and a unique roasted salsa with garden tomatoes and Swiss chard!! Yep. That’s what I said. Bev is a genius. I’d never eaten – hell, seen – Swiss chard until I came across this recipe of hers. Amazeballs, y’all. And yes, I just said that like I’m a 15-year-old girl. Look. 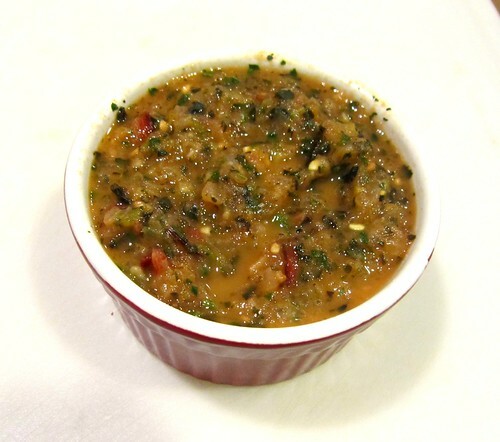 Just look at that salsa down there…how could it not be the most delicious thing you ever put in your mouth? Ok…so maybe not the most delicious (mama’s salsa is still the best) but it’s purdy dang good. And I got to use garden tomatoes and jalapenos in it. Bonus! So get your booty to the kitchen (or the grill outside) and make these tacos. Combine all the spice ingredients in a small bowl and evenly pat it into the steak on both sides. Cover and rest for 30 minutes. Preheat your oven to 350 degrees F, line a baking sheet with foil and set aside. Prepare your salsa veggies (cut them up) and place the tomato, onion jalapeno, cut side down, on the prepared baking sheet. Add the Swiss chard and give everything a light spray of olive oil or cooking spray. Roast for 5-10 minutes, or until slightly charred and softened. The chard will be a little crispy, but not burnt. Remove from the oven and place in a blender or food processor with the garlic, cilantro, salt and pepper and the lime juice. Process until well combined. You can do a rough chop if you like it more chunky. Meanwhile, preheat a grill pan (or your outside grill) over medium-high heat and spray with cooking spray. Grill the steak to your preferred doneness, 3-5 minutes per side. Remove to a cutting board and allow to rest for 10 minutes before cutting into thin slices. While the steak is resting you can make your guacamole by combining the avocado (peel and pit removed), garlic powder and lime juice in a medium bowl and mashing with a fork until smooth. 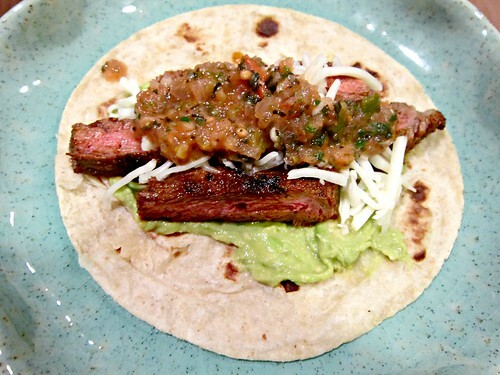 Warm the tortillas and top with guacamole, a few slices of steak, a sprinkle of cheese and a spoonful. of that yummy salsa!